The Fiat 500X is a compact crossover that’s entertaining to drive comes with a choice of front-wheel drive or all-wheel drive. The 2018 Fiat 500X offers more standard equipment than 2017, including a rearview camera and a 7.0-inch touchscreen. New Urbana and Blue Sky editions are available for 2018. 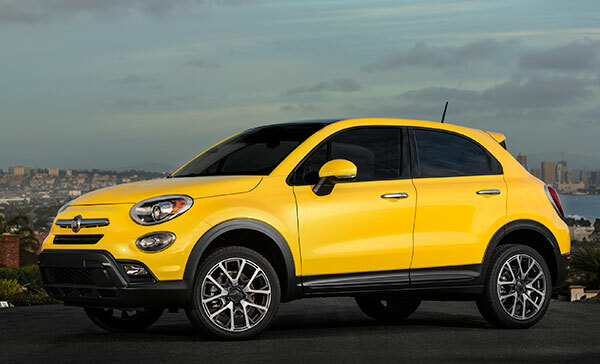 The Fiat 500X is made in Italy to North American standards with heavy American engineering influence. Introduced for the 2016 model year, it didn’t change for 2017. The compact crossover market is booming, and the 500X has a bunch of rivals, including the Jeep Renegade, on whose platform the 500X is built. Also in this class: the Honda HR-V, Chevrolet Trax, Buick Encore, Mazda CX-3, Hyundai Kona, Mini Countryman, just to name some of them. Size-wise, the 500X slots between the super-trim Fiat 500 and awkward 500L. Looking like a tall hatchback, it’s more mainstream than those two. The ride is firm but not punishing, and the handling is responsive but not as quick as the Fiat 500. The available all-wheel drive helps in sand and snow, although it doesn’t give the 500X the offroad capability of the Jeep Renegade, especially not the Trailhawk model. To save fuel, the all-wheel drive actually detaches the driveshaft and rear differential from the front wheels, until wheelspin at the rear calls it back. The main powertrain is a 2.4-liter four cylinder making 180 horsepower and 175 pound-feet of torque, that dates back to the Dodge Caliber, but it’s been much improved over the years. It’s mated to a 9-speed automatic that’s pretty rough, and which Fiat is working on improving. The EPA rates the turbocharged 1.4-liter 500X at 25 miles per gallon City, 34 Highway and 28 Combined; and the front-wheel-drive 2.4-liter at 23/31/27 mpg. The all-wheel drive 500X rates 21/30/24 mpg. It gets great safety reports from the IIHS, who give it the Top Safety Pick Plus rating, including the top Good score for the notoriously difficult small overlap front test, as well as an Advanced rating for front crash prevention when it’s equipped with optional automatic emergency braking. The 2018 Fiat 500 X comes in three models: Pop ($19,995), Trekking ($23,685), and Lounge ($25,515). Pop comes with the 1.4-liter turbo and 6-speed manual. Trekking and Lounge come standard with the 2.4-liter and 9-speed automatic, which is optional for the Pop. All-wheel drive is available with the 2.4-liter engine ($1900). Although it was designed in Italy, the profile of the 500X looks a bit Audi-like, which is to say mature, with clean sides and a gentle arc to the roofline. It keeps Fiat familiarity its chrome mustache, clamshell hood, and stacked twin headlamps. The Trekking has more rugged front fascia and its own wheels, but the same driving personality. The cabin is neat and clean, with nice materials, and big round gauges and climate controls, and a medium-sized LCD screen in the dash for infotainment and camera displays. Despite a shiny swath of black plastic on the dash, the colorful trim makes the 500X cooler than almost all of its rivals. It makes the interior of the Honda HR-V look like an accident. Comfort in front is generally good. The seats are firm, with good lumbar support and limited bolstering that still fits larger passengers. The optional leather seats could use more definition at the bottom and less at the headrests, which have an uncomfortable edge. But there’s a nice knee pad on the side of the center console. Two adults can fit comfortably in the rear, although kneeroom is understandably scant with the front seats pushed back (after all it’s a compact); same with headroom if the optional panoramic moonroof is fitted. The Honda HR-V has more room in rear. The Fiat’s cargo space measures 18.5 cubic feet in the second row and 50.8 cubic feet with the rear seat folded almost flat. The 500X is about five inches shorter than the 500L, but it’s a bit wider and better packaged, so it has almost as much interior room, and it matches most of its rivals. But not the HR-V, with Honda’s fold-away Magic Seat. However the Trekking and Lounge models have an innovative height-adjustable cargo floor that works with a flat-folding passenger seat to enable carrying big and long things like outdoor toys, so the Fiat does its best to make some magic too. Noise in the cabin is fairly low except at full throttle or the revs that 80 mph require. The ingredients for fun might be there, but with no chassis or suspension development since the debut, more time is needed. We like the ride and handling, as well as the 6-speed manual gearbox, but it only comes with the Pop, whose 1.4-liter turbo doesn’t have enough power for any kind of authority. So it leaves us longing for what doesn’t exist: a 2.4-liter six-speed and tuner shocks, to take on BMW and the Mini Countryman. The 2.4-liter engine in the Trekking and Lounge delivers good performance and fuel mileage, but its 9-speed automatic needs more tweaking. We’ve tested this powertrain in the Jeep Cherokee and Chrysler 200, where it feels the same, maybe worse. The engine is mostly smooth if not especially free-revving, and has enough power to easily propel the car’s 3100 pounds, but the transmission lets it down. It’s slow to upshift in the two lowest gears and slow to downshift unless it’s in Sport mode. Paddleshifters would help in these situations, but they’d be a waste the rest of the time. The 500X feels perky, with quick but light steering (although lacking feedback) and pleasing responsiveness, both around town and on the highway. Trekking and Lounge models have the Dynamic Drive system with Auto, Sport, and Traction Plus modes, which change the throttle response, transmission response, and steering resistance. The ride is firm on a strut-type suspension, with good road manners for the class, even with the optional 18-inch wheels. Its cornering is composed despite having a body that’s tall for the wheelbase. But of all the dynamics, the feel of the brakes might be best. It’s frustrating that everything about the 500X works, in turning the Fiat 500 into a crossover, except the powertrains. The 1.4-liter turbo engine in the Pop isn’t quite quick enough for us, and the capable 2.4-liter engine is mated to a transmission that struggles. That said, the Pop is a charmer at its price point.